There are a number of variables that contribute to shrinkage cracks in turned pieces. First and foremost is what part of the log the blank was cut from and whether or not the pith was included. Not uncommon is for the heat of sanding which causes the wood to shrink even more in spite of it being kiln dried. Perhaps if you could post a picture of one or two of your pieces to illustrate where the cracks are occuring with enough detail to see how the grain is oriented we could offer better advice? I have never turned kiln dried wood, which could be your problem. 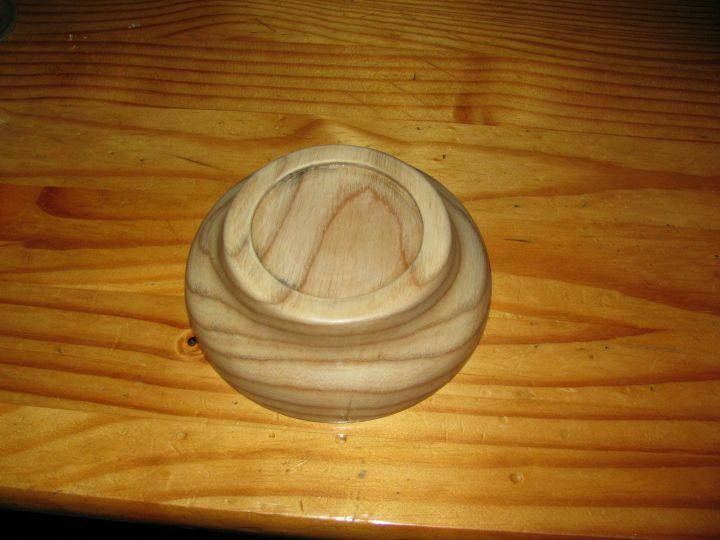 I think it could be too brittle and if there is any reaction in it the wood it will split. Do you have a chain saw? If you do, go out and get a log (the greener the better) and cut it like this. You need to cut the pith out to stop it from splitting. Take one of the halves and turn it to a thickness of 10% of the diameter (10" dia turn to 1" thick) in the shape of bowl you desire. At this point you have several options, a quick internet search should bring up articles on any of these. I’ve done all these and they all seem to work, however many turners will tell you that their way is the best way. If you have any more questions just ask. BTW we love pictures and welcome to the forum. The kiln will take the wood into equilibrium with its environment. Most timber goes to 8% moisture in the kiln, which is equal to a relative humidity of ~40%. Problem is, that's not what the atmosphere outside the kiln registers, so the wood will normally gain up to equilibrium with it. Or lose, if you're in the mountains/desert. So if you kept that wood out in the barn or the shed, then brought it inside to a heated or air-conditioned place to turn, you're going to be vulnerable to drying stress. Now heat it while sanding, and the relative humidity will take another dive - rapid at 1/4" thick, less at a half, and so forth. Contracts and cracks. So keep your wood storage as close to the environment it will serve in, don't go quite as thin and then don't press while sanding. That'll keep the end grain from checking. Some people spritz with water before and periodically during sanding. I'd rather sand gently without heating. First let me welcome you to the forum and I hope we'll be seeing more of you and your work. As to the checking problem, I think most that I know has already been said. My main points would be to keep the heat in check both when turning and sanding. This is sounding more like a thermal problem than anything. If you are riding the bevel too much, or more to the point applying too much pressure, the friction of the bevel to wood could be enough to cause the wood to crack when it gets thin enough. The same thing goes with the sanding. 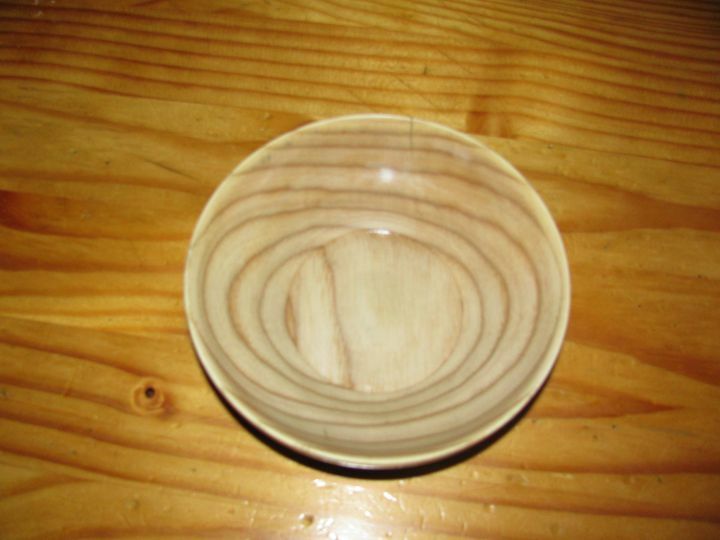 Also if you are turning a large deep bowl, the pressure applied could be forcing the outer edge out of round while its turning, and the flexing could be leading to the cracking. Keep a light touch. Hope this helps and again, welcome. One other thing that can really contribute to checking in addition to all said above is to use SHARP tools. A dull cutting edge creats more friction. That creats heat and can cause cracking. Super sharp tools will go a long way to improving your turning and your results. Search the web for proper sharpening videos to give you an idea. Super sharp tools? Ninety and nine percent of turners go right from a grinding wheel (~100 grit) to the lathe. It's the way you present them that makes the difference. Save the hone and strop for your carving tools or plane irons that have to be used under human power and nose in to the cut. Let the lathe slide the wood along the edge and slice itself off. Don't be in a hurry. Time at the lathe is added to your life, it doesn't take away from it. 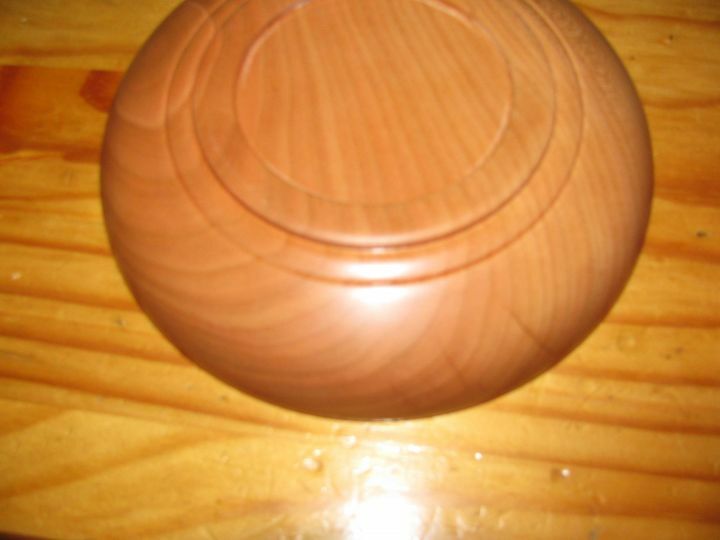 I am beginning to think I am "rushing " my turning If you look I have posted some photos of cherry and ash bowls I have turned.the cherry is thickest and only cracked on the out side. The ash one cracked all the way through and was much thinner.by the way I am not a photographer ................HAHAHAHA btw the dark spot in the cherry bowl is a discoloration in the wood..
Last edited by rauschnad on Mon May 02, 2011 7:41 pm, edited 2 times in total. I have recently cut a log Maple I believe just as you have shown , it was a crotch piece and I will try to cut a bowl from it .I will let you know how it turns out. [quote="rauschnad"]I have recently cut a log Maple I believe just as you have shown , it was a crotch piece and I will try to cut a bowl from it .I will let you know how it turns out. I almost forgot................. "Not all things that Matter can be counted , Not all things that can be counted Matter" Albert E.
Cherry in the second picture is definitely "from the log" split, not from sanding. The first and third photos don't look to have the split in a position normal to drying stress, either. 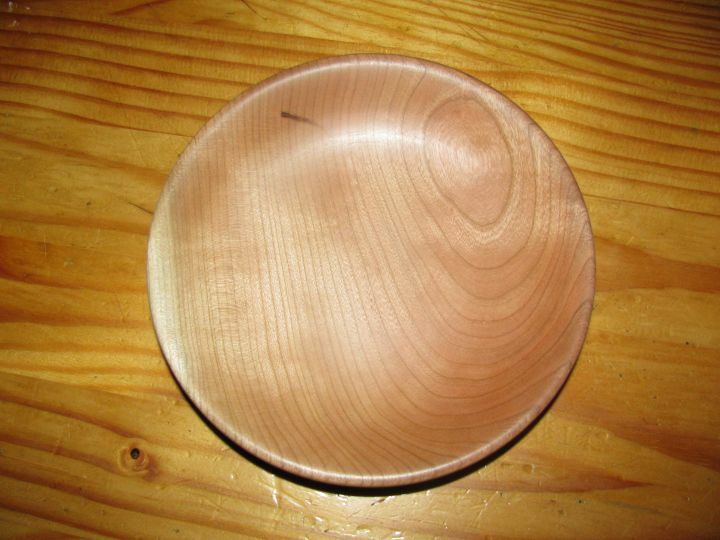 How close to the ends of the wood were these bowls taken? Could all be preexisting damage. I would have to agree with NB George. Those cracks look very familure. It's possible that you couldn't see the cracks until you sanded it. Been there done that. If this is your worst problem as a beginner, I'd say you're doing darn good.